Fans might have to wait a little while longer to see US rapper,Ludacris, as the Grammy Award winning artiste’s trip to Nigeria has been cancelled. It was reported that the ATL rapper who co-runs his label "DisturbingTha Peace Records" (DTP) with co-founder Chaka Zulu were to fly into Lagos to launch a TV reality show called "The African Superstar". A poster disper around had suggested that "Luda" had teamed up with media outfits Konnect Afrika and Xtrem Media to host a ‘Disturbing Tha Peace Wit’ Luda’ gig on Sunday, July 31, 2011.A press conference was to hold the next day. But on the day of the event, a press statement was dispersed via E-mail which states that the rapper had unveiled "African Superstar" from Dar Es Salaam in Tanzania. It reads:‘We sincerely apologize for the inconvenience, but word reaching us from Tanzania just confirmed that Ludacris’ trip to Lagos has been postponed, due to complications with the flight/air traffic flight plan from Dar Es Salaam. 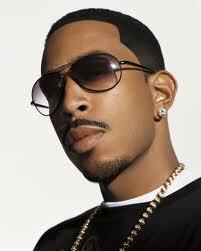 The ‘Disturbing Tha Peace Wit’ Luda’-tagged party in Lagos will no longer take place as scheduled. A formal press release follows shortly.